Chiltern could be said to be a cousin of Farnell. In 1919 Leon Rees inherited his father’s toy works in Buckinghamshire, in the Chiltern Hills. The Farnell influence soon came to bear when Leon joined up with Farnell’s Harry Stone. The company became H.G.Stone & Company, but kept it’s Chiltern trademark. 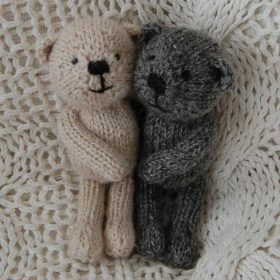 One of the early successes, from about 1923, was the Hugmee teddy bear, which stayed popular until Chad Valley took over the firm in 1967. Hugmee teddy bears pride themselves on being particularly cuddly, because of the soft kapok filling and you can often tell a Hugmee bear by his posture as they seem to sit in exactly the same way, heads drooping a little since their squishy filling can’t support their heavy heads too well. 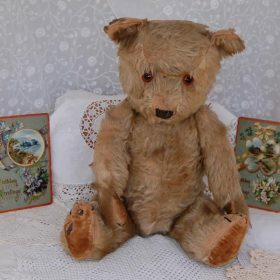 Chiltern bears are very handsome and had changed little until 1958 when the realistic plastic nose was introduced.